Great Red Dragon - The Crown and The Eagle: Is U.S.A. Being Used? The Crown and The Eagle: Is U.S.A. Being Used? Back in September of 2008, Dominic Sandbrook reviewed the book "The Eagle and The Crown," written by Frank Prochaska, lecturer and senior research scholar in the Department of History at Yale University. The book was published by Yale University Press. Since the whole point of the American Revolution was to throw off the supposedly tyrannical rule of the old country, its excesses apparently embodied in the terrible despotism of George III, the enduring American love affair with the British monarchy has often puzzled foreign observers. In the Yale historian Frank Prochaska's lucid, thoughtful and entertaining book, however, all becomes clear. He reminds us that royalist sentiment was always deeply embedded in the soil of the early republic, even among many Founding Fathers themselves. I knew right away that they had this completely backward. It's really "The Crown and The Eagle." 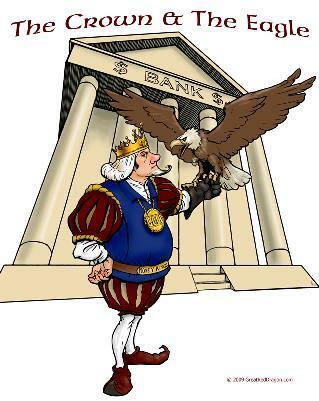 However, the Crown is NOT the King, but the Money Kings that finance both UK's Monarchy and simple majority of Parliament, as well as USA's presidents and simple majority of Congress and other governments around the world. The U.S. may have won many battles, but it never won the financial war. No one has in over 400 years, according to the "Rise of the Money Power"
"An Imperialism of Capital has grown up within the last two centuries  from small beginnings, until it is now the mightiest power that has ever existed on earth. It is an Imperialism mightier than the empire of the Caesars, grander than the empire of Napoleon in the hour of his highest glory. In comparison with it, all other empires sink into comparative insignificance. This titanic power is the Imperialism of Capital, which I call, by way of distinction, the Money Power." In fact, the Money Kings are consolidating their power in today's floundering economic times as they press towards their goal, to own the earth in fee simple. As bad as 2008 was for Merrill Lynch & Co., it was very good for Andrea Orcel, the firm's top investment banker. Although Merrill's net loss ballooned to $27.6 billion last year, Mr. Orcel, 45 years old, was paid $33.8 million in cash and stock, just shy of his pay in 2007. While Merrill staggered, 11 top executives were paid more than $10 million in cash and stock last year, say people familiar with the situation. An additional 149 received $3 million or more. For 20 years, Yale was part of the British East India Company, and he became the second governor of a settlement at Madras (now Chennai), India, in 1687, after Streynsham Master. He was instrumental in the development of the Government General Hospital, housed at Fort St. George. Yale amassed a fortune in his lifetime, largely through secret contracts with Madras merchants, against the East India Company's directive. By 1692, Elihu Yale's repeated flouting of East India Company regulations and growing embarrassment at his illegal profiteering resulted in his being relieved of the post of governor. That's why there's a commentary here about the India-ization of America. The award, in recognition of Kennedy's service to the US-UK relationship and to Northern Ireland, comes as Prime Minister Gordon Brown visits Washington to meet with President Barack Obama and address the US Congress today. It would be interesting to know exactly what "services" were performed for who's benefit. You should also note that Gordon Brown is the man who sold 400 tons of England's citizens' gold. Gordon Brown is to face questions in parliament after revelations that he disregarded advice from the Bank of England before he sold off more than half the country抯 gold reserves at the bottom of the market. They have revealed that Bank of England officials had serious misgivings over the chancellor抯 determination to sell 400 tons of bullion in a series of auctions between 1999 and 2002, when the price was at a 20-year low. Since then the price has almost trebled, meaning the decision cost the taxpayer an estimated �billion. What I would really like to know is who the buyers were in that transaction! The ones who made a �billion profit. I suspect that England's gold was transferred into the private hands of money kings. What's even more interesting is why Americans do not wonder the whereabouts of their own country's gold. A few do and have put their money on the line: GATA's Advertisement In The Wall Street Journal.